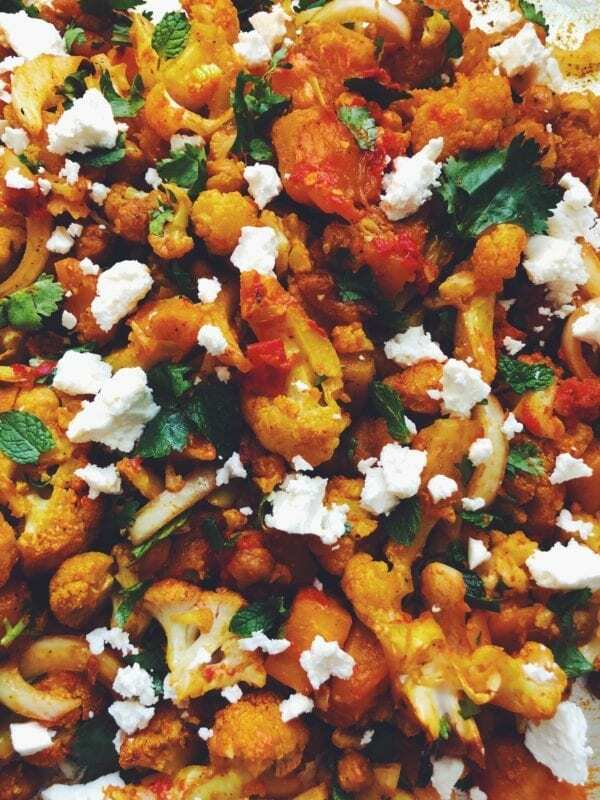 This oven roasted turmeric cauliflower dish with honey harissa butternut squash and crispy chickpeas is topped with feta cheese and fresh herbs – packing it full of flavor! 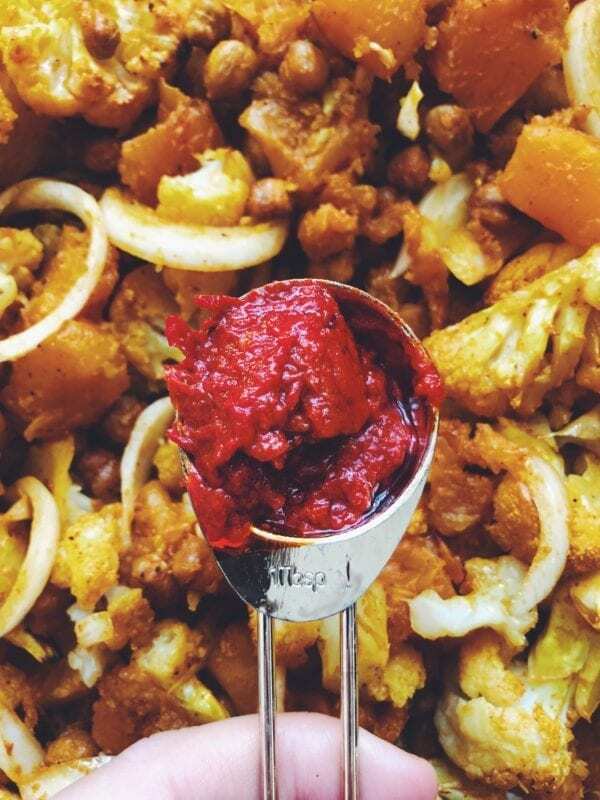 It’s healthy, hearty and totally addicting! 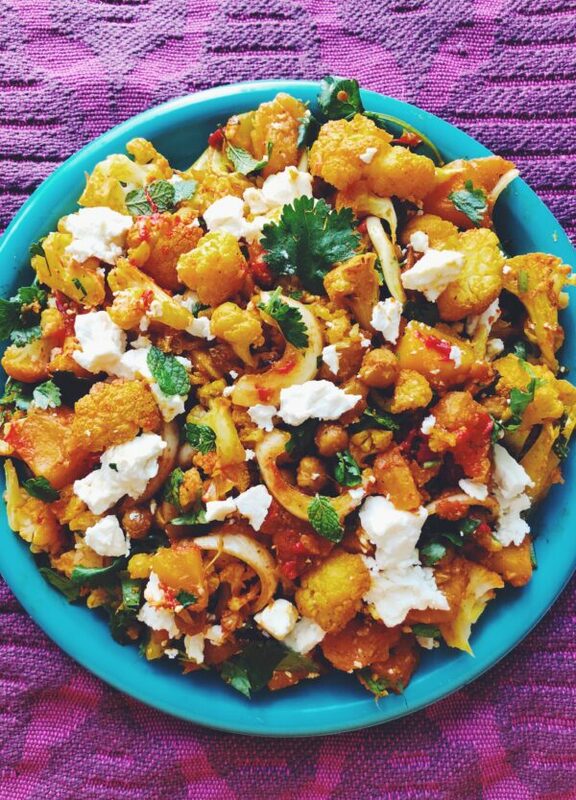 When it’s cold out, I crave roasted veggies like this simple and colorful oven roasted turmeric cauliflower. 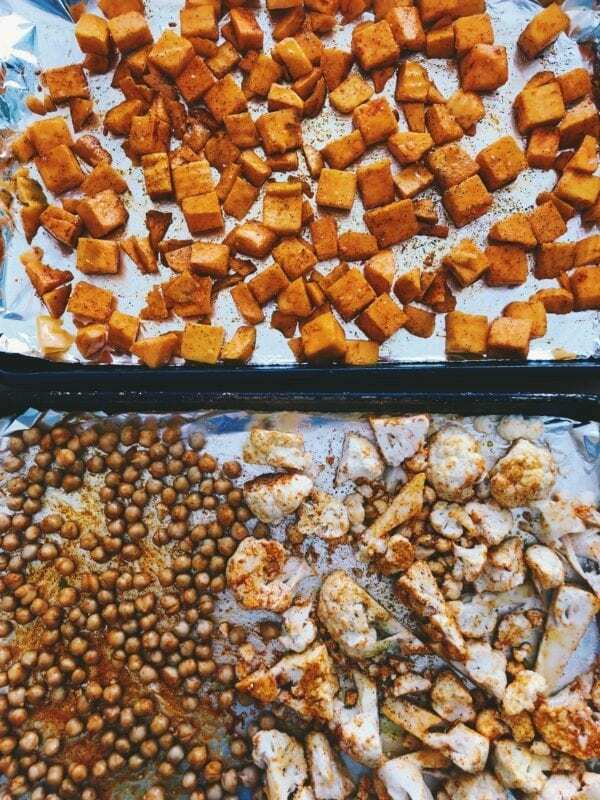 And because I’m so in love with fall vegetables, I even added some extra goodness for even more flavor! 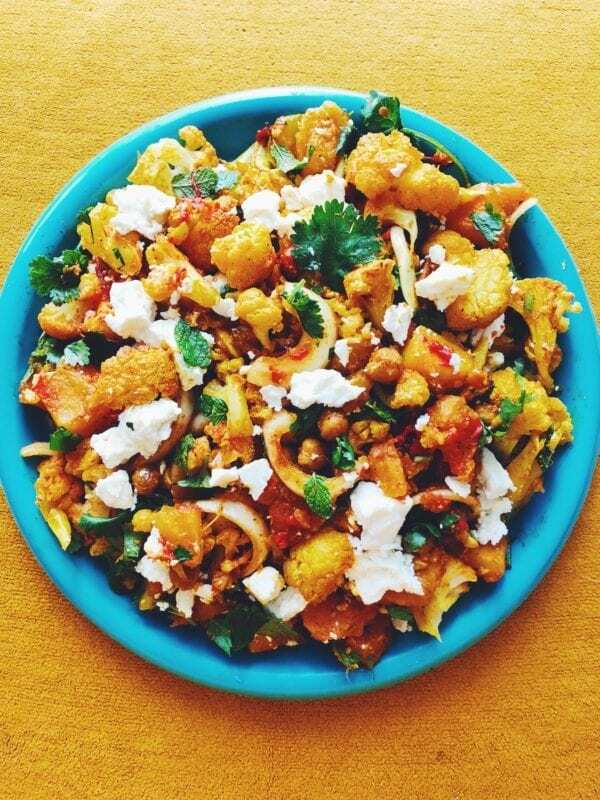 Sweet and tender butternut squash and crispy chickpeas are the perfect textural contrasts to the cauliflower. And when you add tangy feta cheese, fresh fragrant herbs, and crunchy vidalia onions, the whole dish comes together perfectly. 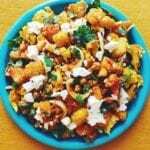 To be honest, I sometimes call these sort of dishes – Hot Salad – and I eat them in one big delicious bowl. My husband, however, always laughs at me when I call it that. Soo ummm…. anyone want to help me come up for a new name that isn’t so unappetizing? lol. But anyways, let’s get back to it. You can be like me and eat this as its own meal or you could definitely serve it with grilled chicken and brown rice or maybe even wrapped up in pita with tzaziki sauce. Or with a deep fried chicken sandwich with pomegranate bbq sauce and avocaodo depending on how healthy you’re trying to be. Omg wait, should I make that next? Sounds delicious. 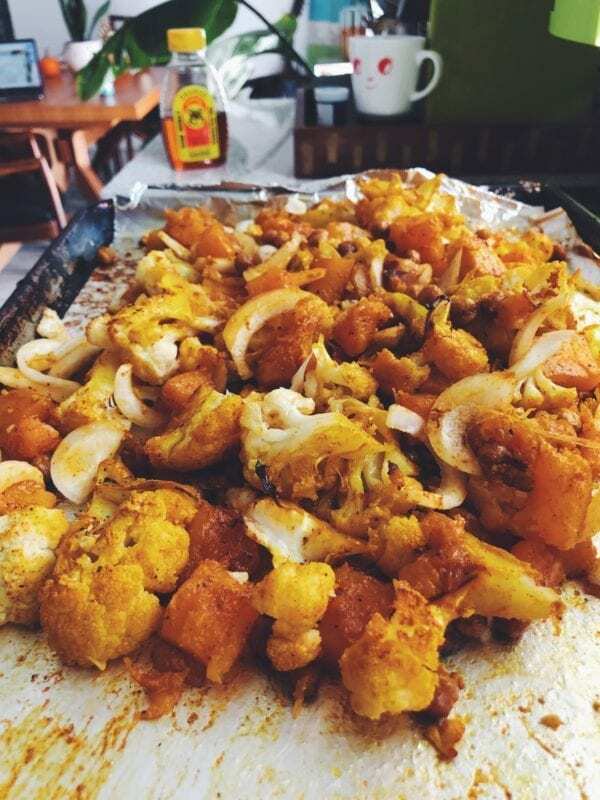 Roasting cauliflower is super easy. Begin by preheating the oven to 400F then line a baking sheet with tinfoil. Next, break one cauliflower head down into smaller florets. Then drizzle with two tablespoons of olive or avocado oil and sprinkle it with a few pinches of salt. Toss it together and bake for 30 minutes or until it starts to get brown and crispy on the bottom. Simple as that! See you’re already being healthier just by knowing that! If you like this recipe, you might also like this roasted broccoli with herby tahini sauce or spicy lemon detox soup, or my favorite heirloom tomato galette with citrus salad. Or try my pho inspired deviled eggs or my other favorite I’m trying to be healthy dish — larb gai!